Thoughts create beliefs — a belief being a thought that has been repeated to the point where it isn’t as immediately open to enquiry. It can become entrenched like the grooves of a record, which is only capable of playing the same song, over and over again. If that song is a song of fear, one that drowns out your connection to what lies at the very heart of you and separates you from your Self, then you have a choice. What do you feel when you see these cards? Tell me. What do you feel? Once you’ve identified your feelings, how about this: what was the thought on which your feelings were predicated? And how were you feeling before you had the thought? Was there a significant shift in how you were feeling before you saw the reading, and how you felt afterwards? If so, then perhaps you have come away with a greater sense of the power that your thoughts about what you see have in affecting your perception of reality. The Tower, Three of Swords, Eight of Swords from the Rider-Waite Smith Tarot deck, created by A E Waite and illustrated by Pamela Colman Smith. Click on the image for a larger version. Thoughts create beliefs — a belief being a thought that has been repeated to the point where it isn’t as immediately open to enquiry. It can become entrenched like the grooves of a record, which is only capable of playing the same song, over and over again. If that song is a song of fear, one that drowns out your connection to what lies at the very heart of you and separates you from your Self, then you have a choice. You can stick with the song you know — predictable, familiar, conjuring equally predictable and familiar feelings. Or you can see the song for what it is and the effect it has on you each time you get it out and play it. When you can do that, your options expand and you open yourself to freedom. Take a look at the cards again. It may be that all is not what it at first seems. 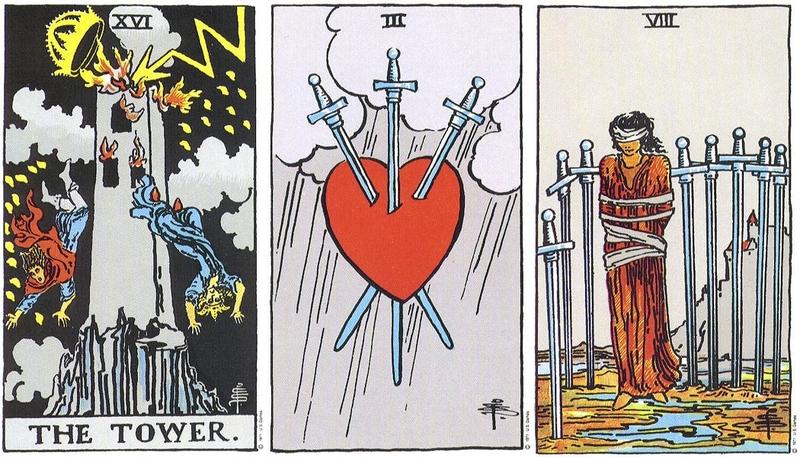 On the left there is The Tower, in the centre the Three of Swords, and on the right the Eight of Swords: one major arcana card, which points to an archetypal experience, followed by two cards that describe the thoughts about that experience. The Tower lies at the foundation of the reading — it has already happened in one form or another. When The Tower has been activated in our lives, we live through an upheaval over which we have little or no control. It occurs when a structure we have built — whether literal or metaphorical — has moved so far out of integrity with our essential selves that it can no longer exist in its current form. The soul seeks freedom and creativity, and it cannot live fully in the confines of an inflexible and constricting ivory tower. In a misguided attempt to create a place of safety, where we crown ourselves kings over our lives, we find out sooner or later that the ivory becomes grey and lifeless, the skies surrounding it rendered black and without a source of light. Thus we are overthrown by a higher authority that sees beyond the walls we’ve constructed around us: the divine breaks into consciousness with full impact. When the lightning strikes, it is the lightning of the transpersonal. What falls releases an element of the psyche that has been trapped or isolated by our actions, however well-intentioned, and the energy to the card will very often be felt collectively as well as personally. In the second card, the foundation of The Tower is given its context — that of relationship. The Three of Swords is typically a love triangle of one form or another, whether personal, familial, professional, or the divided allegiances of communities, governments and cultures. Remember that Swords are thoughts, though — not emotions and not material reality. In the Three of Swords, we witness the belief that we can lay claim to love in the face of perceived competition. By asserting ownership over something that cannot be controlled, we strike to the heart of the love itself. We are not the victims as much as love is. Our limiting thoughts have wounded the very thing we wanted to have; the skies weep with us. And so to the Eight of Swords. Looking at the swords around the bound and blindfolded figure, there are three swords at the left of the picture, a reflection of the Three of Swords. The figure is turned towards them, aware of their presence, but she cannot see the reality of her circumstances. This demonstrates an inability to see fully, or to recognise that, although the swords — her thoughts — feel familiar, what she is encountering is in fact different. The Three of Swords is resonating. It has started to play its song, one that she has known before. Yet the song is in her mind; it is not an emotional or physical reality. If she were to exercise her right to freedom, she could remove her blindfold and see the threat for what it is: static blades, unmanned by others, points embedded in the ground. Weapons of her imagination. Astrologically, we are entering the energy of the grand water trine now, which stretches over the next season and beyond. Water in tarot is the domain of the Cups suit, and it represents both the emotions and the unconscious. When we move into the deeper waters of our psyche, our conscious mind can interpret this sense of fluidity as a threat, and it throws up all of the thought patterns that have become entrenched as a way of defending against it. Thus we meet the Cups energy with Swords. We try to think ourselves out of a sensation that asks for no-thought. We do this by running tried and tested thought patterns, because that is what our mind defaults to. We bring out our old records and we play them. But our feeling natures work differently. They move with the beat of our hearts; they are attuned to a wisdom that transcends thought. The old patterns no longer apply. All the old patterns do is to keep us in the landscape of the Eight of Swords: blind to our power, trapped in the shallows while the sea is waiting a little further beyond to welcome us. Freedom is right in front of you, if you are able to see your prison for what it is. It is the prison of your thoughts and your beliefs, and what you tell yourself based on them. What has happened in the past only continues to happen in the ideas you have about it. Look at the thoughts that hold you hostage, bring them out into the open and talk about them, and disarm them. Be prepared to see another way, and another way is open to you.